Bestselling author Cecelia Ahern is all geared up for the launch of her new book of short stories, Roar. Photo: David Conachy. 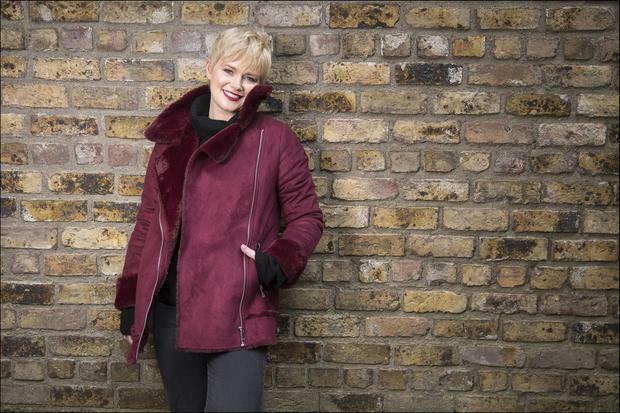 Cecelia Ahern has been working on her latest book, Roar, for five years. For a writer with an almost legendary output - 15 books in 14 years - for whom the start of the writing process is not a struggle, but a delight, choosing between two ideas, rather than struggling to come up with one, this is a huge change of tack. But Roar differs from any of Cecelia's previous work. Written for herself, as much as with the intent of publication, it is a collection of 30 short stories about women at crucial moments of their lives. It is funny, magical, and her most powerful, most feminist work yet. "There's more of a punch to these stories," Cecelia, herself reflects, when we meet in her office in Malahide near where she lives, two large reception rooms at the front of a Georgian terraced house with views from her desk of the sea. "I write every novel with freedom, or so I thought, until I wrote this," Cecelia reflects. Stylistically, she allowed herself free rein. None of the women have names. Stories end unexpectedly. The magic realism, often a feature of her work, is more pronounced than ever. These are real situations, but described from an unusual point of view; a woman actually sitting on a shelf, a woman emitting the sound of a ticking clock, a woman who is literally swallowed up by the floor. She wrote the first one five years ago on a family holiday in Kerry, when her children were three and one. "I sat on a bench in front of the sea, and wrote the story." This was The Woman Who Slowly Disappeared, about a woman who is actually fading away. It was inspired by a meeting in LA with TV people, one of whom explained to Cecelia, well-meaningly, that the appeal of her work, in their eyes, lay in the fact that her characters were mostly women, mostly in their thirties. The target audience of networks, and the advertisers who fund them. Cecelia was horrified. "I just sat there thinking 'no, this is not what I want to hear. I don't write for those reasons'," she recalls now. "What about the women who are over 55?" she asked. Of no interest, came the reply. Given that these stories are issue driven, as opposed to a full book about a specific character, this feels more than ever like a close-up glimpse into Cecelia's mind; what matters to her, what she really feels about things. In ways, it's a sort of manifesto. As a mother of two children, she says she particularly relates to some of the stories on this theme. "I don't want to psychoanalyse myself, but why did that come out then, at that moment on my holiday?" she says of the original story. "Maybe that was me giving myself a bit of a…" she gestures a sort of shove. "You know, 'don't disappear here. Find yourself. Stay with it'." The third story she wrote, The Woman Who Found Bite Marks on Her Skin, is about a mother riddled with guilt over leaving her children, when she goes back to work after maternity leave. "I remember the day I brought my daughter to Montessori, she cried her eyes out. Left my baby, he cried his eyes out. I sat in my car, cried my eyes out." She went to work, and, at the end of the day, wrote that story. "On the last line I wrote 'now go home Cecelia', so I obviously did that for myself. Instead of it being a diary entry, I just took a concept and gave it to someone else and worked through it." These stories will speak to women everywhere, but they seem particularly prescient given the #MeToo and #TimesUp movements. There had been no interest in the stories until Cecelia attended a meeting in America in 2017 about other projects. Asked what else she was passionate about, she showed them these essays. Trump had just been inaugurated. The Women's March was taking place that Saturday. The people at the meeting read her stories and wept. Nicole Kidman is now one of the team of producers who will create the television series adaptation of Roar. "How exciting," beams Cecelia, who herself is an executive producer on the project. "I've been bursting to share this for a year." If there is one thing in common with most of these pieces, it is that they cover a transitional moment in the character's lives. "That moment where you're sitting having a conversation with yourself," Cecelia herself explains. "Something's not right. I've known it for awhile. But right now, I'm ready to address it. I'm either going to accept it, or make a change. Finding your voice is such an overused phrase at this stage but I believe in it." It's a situation Cecelia regularly examines in her work; her interest in it springs from a difficult time in her own life. Aged 21, she left an MA in film after one day, paralysed by panic attacks. "I do hate talking about it, but it's so hard to talk about what I do otherwise. I have not had a difficult, traumatic life. But it was a difficult thing for me to overcome, that anxiety, panic attack phase." Cognitive Behavioural Therapy helped. "Because it's a series of thoughts that are leading up to this build up of panic. If you can recognise the moment, you start to think like that, you can change it. "I let it take over," she explains. "I let it rule me. I thought this thing was bigger than me. I probably didn't have that many panic attacks, but what happens is the fear of them takes over. Your world becomes so much smaller." As scary as it was, this time made Cecelia the author she is today - a woman who has sold over 25m copies of her books. Leaving the course, she retreated to her mother's house in Malahide, and began to write, finishing P.S. I Love You, her first book, in three months. She was utterly changed by this time. As a teenager, Cecelia taught dance, performed in panto and Boogie Nights, and competed in Eurosong with Shimma, a band put together by Louis Walsh. It's hard to imagine now of this woman, who spends much of her time working long days on her own, who so clearly thrives in her own company, admits to being an extroverted introvert, a one-to-one rather than a lover of crowds. "After every event I can't do the dinner; I'm back in the hotel. I'm always apologising, 'sorry guys I'm just drained'. I've only realised that in the last few years. I started reading Quiet: the Power of Introverts in a World That Can't Stop Talking by Susan Cain, and I started to understand myself a lot more, and to realise that it's OK to have to step back from people. It doesn't make me rude, it just means that I have to re-energise. Slow, nice conversations are how I would unwind." Growing up in a "house of girls" she says her mother, sister Georgina and herself, were always really respectful of each other's space. Now, her sister tells her her house is such a quite house. "We are a crazy, fun, kind of eccentric house, but the noise level, we try to keep it calm. I don't notice these kinds of things until I'm out with other families." Looking back at her former self, Cecelia smiles. "I'd never do the things that I did then," she remembers gently of her late teens, when she taught dance and performed regularly. "I used to hang out with dancers all the time. And dancers are wild and fun and energetic. Up on the tables doing high kicks when you're out in clubs. I was surrounded by this and found it so much fun. And yet the nickname one of my friends had for me was 'Insecurity'. Because I was always questioning; this isn't real. Why is no one looking me in the eye when they talk to me? Even though I was part of that world, I was waiting for the realness to begin. So I was 'Insecurity'." Now, she says she was still herself within this very extrovert world. Still writing. There were just two sides of her. Dancing was "where I got my release", she recalls. "I think what happened was I lost my performance side. The panic set in, I didn't want anyone to look at me, didn't want to leave my house." To this day, she isn't sure why this all happened. "I tried at the time to analyse it a lot. There was no one incident," she says. Now, motherhood has been a huge source of confidence. Cecelia has a son and a daughter with her husband David Keoghan, whom she met in a nightclub when she was 19. Roar feels like Cecelia at her most confident yet. "You have to do things on behalf of your children that you just wouldn't otherwise. I'm getting much better in the last few years at speaking up for myself. That saying nothing is quite hard; I'm so much better now. You are your children's voice for so long, and that helps you then in your own life. Confidence about her work has never been a problem. She wears her great talent, and success, lightly, but below her well-mannered modesty is a rock-solid belief in herself. She is her own best judge of her writing, doesn't feel the need to run an idea past even her editor. "I really trust my own instincts," she explains. "It's the only thing I think I'm good at." In an interview with The Irish Times in 2015, when asked about her father, former taoiseach Bertie Ahern, she wryly commented: "Cecelia has a lot to say, but Cecelia doesn't say it." This is Cecelia to a tee. She's reserved by nature, but that should not be read as a weakness. She's feisty, funny, clever and sardonic. You do wonder if her family's position, specifically her father's political career, has meant she has, to some extent, minded her Ps and Qs. There's also the fact that when her first book came out, to huge fanfare, she experienced hazing from certain press and public, something that could engender a certain withholding of oneself. "I think at that stage, the world that we were in then, the family situation, I was prepared. I was prepared for awfulness, unfortunately," she says now. At one stage, she briefly considered publishing under a pseudonym. "But then we thought I'd go on Ireland AM and they'd be like 'Hi Cecelia, why are you writing as Mary Brown?' What would the point be?" There were accusations that her father got her the book deal. That her mother wrote the book. "I got it all the time. To my face. Constantly." Part of it, she believes, was down to being a woman of such a young age. "A 21-year-old woman was not supposed to be that successful. If I was a 21-year-old footballer, and I had signed a multi-million deal, first of all no one would bat an eyelid, and they would be celebrated. But it was a constant; I had to prove myself. And explain myself and justify, and apologise; 'I know this never happens to anyone, and I'm so fortunate that it happened to me'. Constantly. For so long." She and David would fly business class and they would be asked if they had won a competition. She went to buy a car and was asked if her husband was buying it for her. "It's given me such a perspective on what it is to be a young woman, in business, making money, being successful on your own. Everyone wants you to explain it. How did it happen? I don't think that happens with men. There's no explanations, no second thought. If I was the son of a politician I'm pretty sure it would be different. "I'm not an activist," she reflects now. "I have feelings, and I write them," she says firmly, referring to one of the stories, The Woman Who Guarded Gonads, about a committee of women before whom men appear to apply for a vasectomy. "Unfortunately it's come out too late for the Repeal, but that's how I communicate things and process things and get my message out. I can't go out and stand with a mic and speak to the masses. I'll never be that person." That is her nature, she says, and not a self-imposed censorship. Although she is careful about what she says, or posts online, about her father. "I suppose I'll sum it up by saying there's a bit of both [self-reserve and self-censorship]. I don't want to be an activist. I can find my voice in my work, and I can speak stronger with my work than I can in any other platform. But because people don't always read me, they don't know. They're like 'God she hasn't said anything about anything'. I'm like reeeead," she laughs in frustration. "It's all there between the lines, in the lines. That's always been my way." Cecelia turned 37 last month. She doesn't mind getting older, "because I'm fine. I think it's got to do with are you happy with where you've got in your life by that point. So I'm OK. So long as I can stay fit and healthy."